Charity Organization of Bangladeshi Arizonans has come forward to help the people from Rakhine State of Myanmar. USD 7500 was handed over to the National Headquarters of the Bangladesh Red Crescent Society from Charity Organization of Bangladeshi Arizonans as a part of humanitarian assistance. 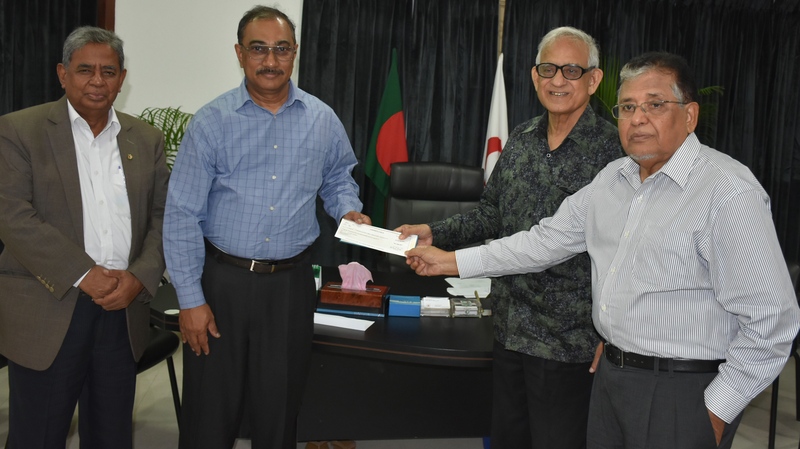 Honarable Chairman of Bangladesh Red Crescent Society Mr. Hafiz Ahmed Mazumdar received the check of donations at the Chairman’s Office of the National Headquarters this morning. American Expatriate Mr. Mohammad Faruque, PMP handed over this check. Treasurer of Bangladesh Red Crescent Society Advocate Touhidur Rahman, Managing Board member Advocate Shihabuddin Shaheen and Secretary General of Bangladesh Red Crescent Society Mr. B.M.M Mozharul Huq, ndc were also present on the occasion. Bangladesh Red Crescent Society’s Chairman Mr. Hafiz Ahmed Mazumdar informed that Bangladesh Red Crescent Society has continued to distribute food and other essential items to Myanmar nationals who have taken shelter in Bangladesh. Free treatment is also being provided to them. The money received from the Charity Organization of Bangladeshi Arizonans (COBA) will also be used to support the vulnerable People from Rakhine state of Myanmar.